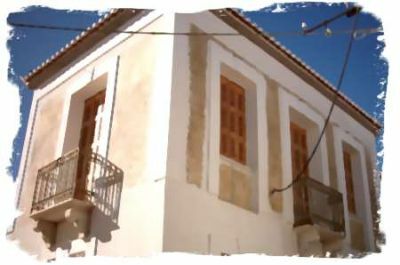 Ermioni.com is the new website for the town of Ermioni in the Argolis area of the Peloponnese, Greece. 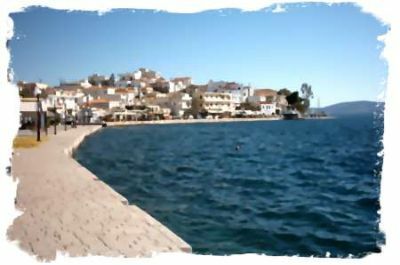 With the Athens 2004 Olympics last year Ermioni is the perfect holiday destination with only a short boat trip to Athens, with all its Historic Attractions. 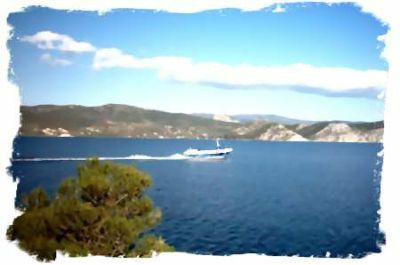 With loads of holiday Villas, Apartments & Hotels, Travel on the Hydrofoils to the Greek Islands, & buses on the mainland make it east to visit Hydra, Spetes, Nafplio, Kranidi & Epidaurus. 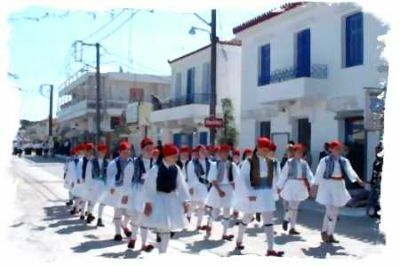 Take a look at the following Photo Galleries & Tourist Infomation pages to help you plan you trip. 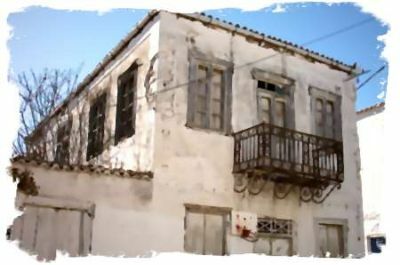 in buying a Greek Property? 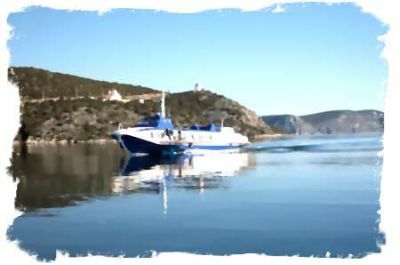 Bus & Boat, Coach & Train companies in Greece. 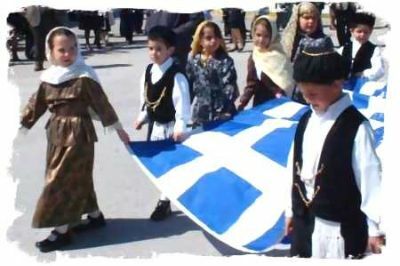 Read our Guestbook, and feel free to Post your own Message about your trip to Greece. 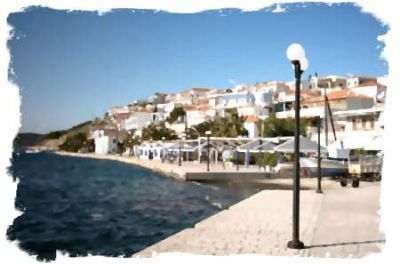 and I live in the beautiful Greek town of Ermioni. Would you like me to show you around? tour of my home town if you want? 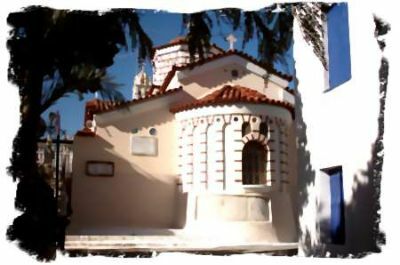 attractions in the Argolis and Peloponnese area. 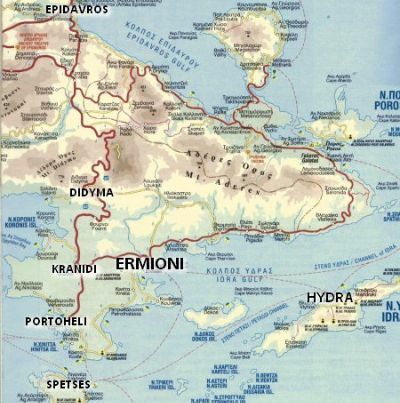 Visit MultiMap.com for a map of the Peloponnese, Ermioni, and all of Greece. Just click on the button! 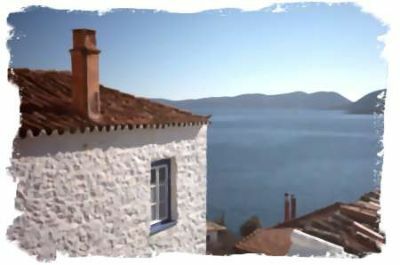 Ermioni is built across a peninsula embraced by the sea on both sides, giving it the feeling of an island town with the benefits of being on the mainland. 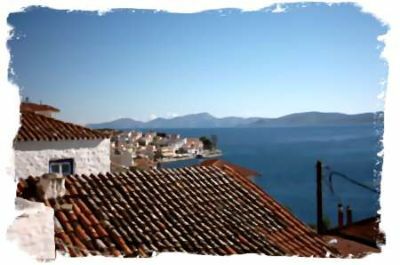 The old town rises up a hillside, with splendid views to nearby islands and a fertile plain rich in pomegranates, citrus fruits and olive groves. 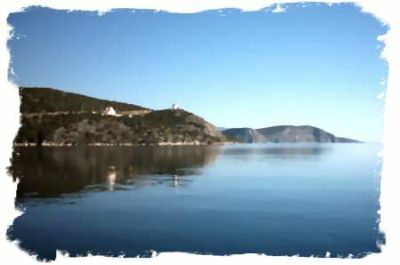 Below, the northern bay forms a natural harbour for the busy little port where you see fishermen cleaning their nets and small shops and cafes. 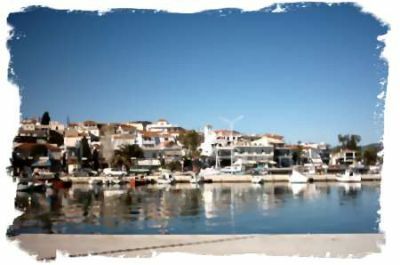 Mandraki, to the south, offers a good selection of quay side restaurants, bars and traditional Tavernas with their octopuses hanging outside to dry in the sun. 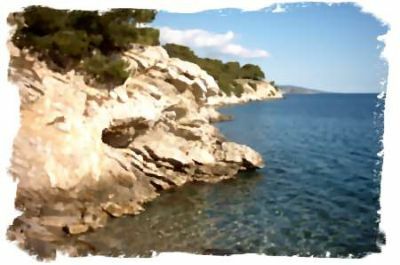 At the peninsula’s tip is a pine-covered Bisti, where rocky coves offer great swimming in calm crystal clear waters. 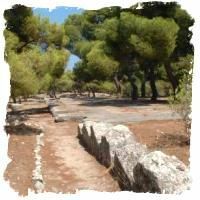 Walkers will discover the stone foundations of Temples, and the remains of "Cyclopean Walls". 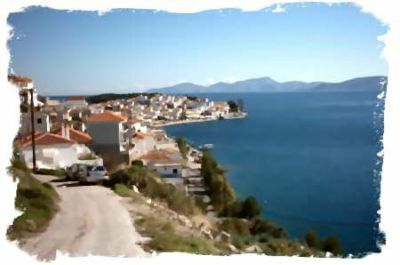 Here and on the opposite hillside are two renovated windmills from which you get great views of Ermioni and across to the Islands. Thats the place the locals call the Bisti. I like it because on a hot day I can go for a swim to cool down. 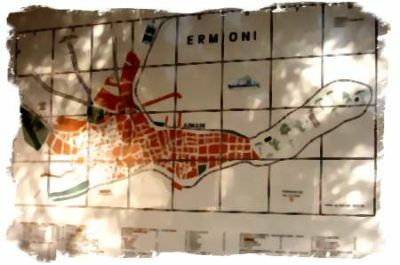 Thats the Ermioni map that you can find in the town. Its not much use to me, but the Humans that come here in the summer like it. 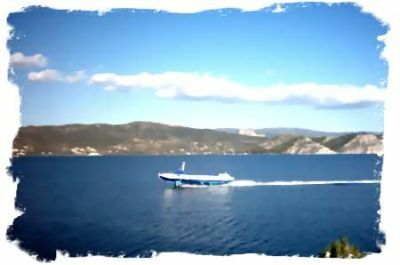 That boat is the Hydrofoil or Flying Dolphin. 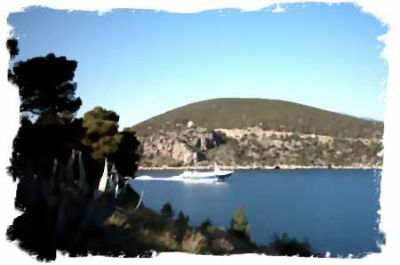 Most of the tourists come to Ermioni on the boat as its the fastest way from Athens. 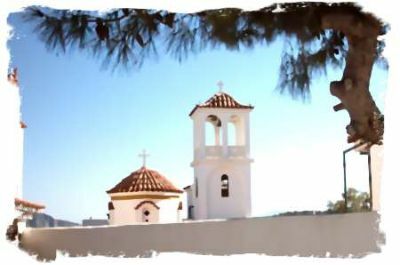 This is just one of the churches in Ermioni, but I think its one of the nicest if a dog is allowed to have an opinion. They all have bells, and you humans love to ring at every opportunity. I will show you some more churches later if you want? Over on the hill is a small church and a wind mill, I will show you them later. 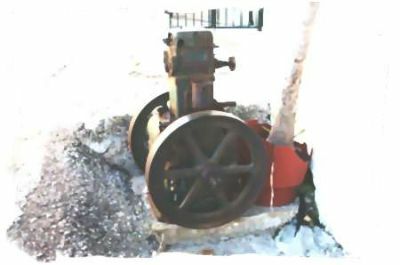 Thats a very old Lister Stationary Engine in one of the streets in Ermioni. I think it may be of interest to you because it was made in England. 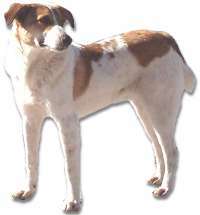 Just click on me and I will take you to the next page.